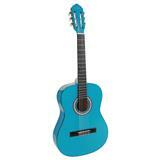 A very affordable, yet complete guitar in a fresh bleu color. It has silver nickel frets, steady quality tuners and a truss rod. A very affordable, yet complete guitar in a fresh pink color. It has silver nickel frets, steady quality tuners and a truss rod. 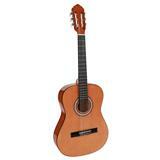 A very affordable, yet complete guitar in a glossy natural color. It has silver nickel frets, steady quality tuners and a truss rod.